The AL10 Path Light features the classic look of a pagoda top with a lower profile design. 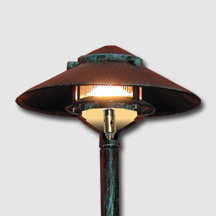 The wide selection of finishes available allows this fixture to subtly blend into any landscape or lawn design. The textured surface enhances the overall aesthetic quality of this traditional fixture. Constructed of die cast aluminum, it is available with a separate 2", 6”, 12”, or 18” tall, ½” NPT stem, 20W 12V lamp (low voltage models only), and separate mounting stake. Available with a single tier pagoda with a 10” diameter top. Provided with a 3’ long 18 ga. whip and low voltage connector. The fixture is finished with a durable polyester powdercoat paint.